On January 22, the remains of 101 Korean military conscripts killed in nearly a dozen countries were returned to South Korea from Yutenji Temple in Tokyo, following an official memorial ceremony attended by high-ranking diplomats from Japan and South Korea. The Japanese government, for the first time, invited 50 South Korean family members to attend the ceremony -- paying their travel and lodging expenses and providing about $300 in condolence money for each fatality. The South Korean government extended similar condolence payments. Memorial services for Korean remains repatriated from Japan six decades after World War II were conducted in a variety of religious traditions at the Manhyange Dongsan national cemetery in South Korea in January. Public hearings held across South Korea have helped former conscripts reclaim their dignity and produced a historical record of the forced labor experience -- along with a list of more than 2,000 Japanese firms that benefited. Oral histories have been published, in Korean and Japanese, and a documentary movie is being planned. A truth commission website helps former conscripts locate wartime companions, with the site's database of high-resolution photos being searchable by year of conscription, destination and type of work. The South Korean government plans to eventually open a forced labor museum and research center, most likely in the southeastern city of Pusan. The Japanese government claims, despite much historical evidence to the contrary, that the state was never directly involved in labor conscription by Japanese companies. On this basis, Tokyo insists it does not know how many Korean civilians were conscripted or how many died in the custody of private firms -- and displays little interest in finding out. Left: Community researchers in August 2006 describe a former Mitsubishi coal mine in Iizuka, Fukuoka, to South Korean truth commission members and Korean relatives of a forced laborer who died in a wartime explosion there. 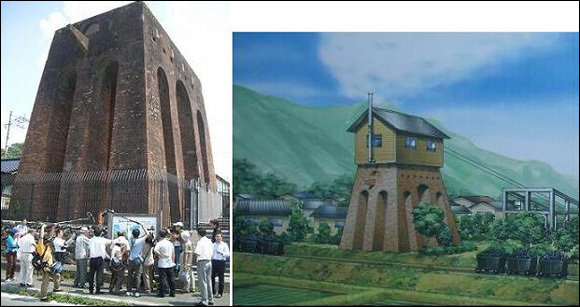 Right: Historical rendering of the Mitsubishi Iizuka mine tower from the landmark’s signboard. In addition to fixed-amount compensation, the new law also calls for the South Korean state to make individualized payments to former conscripts and families based on financial deposits now held by the Bank of Japan (BOJ) -- money that forced laborers earned but never received. The 60-year-old deposits consist largely of unpaid wages, pension contributions, and death and disability benefits for both civilian and military conscripts. Neither is the Japanese government helping to send the bones of civilian conscripts home to Korea. In late February, a citizens group called the Hokkaido Forum returned the remains of three Korean teenagers killed at Nippon Steel's Muroran foundry in July 1945 during an American naval bombardment, along with the remains of a fourth conscript who died at a nearby coal mine during the war. The government rejected the group's request for an official representative to attend the Muroran memorial service and for travel expenses, funeral expenses and condolence money to be paid to visiting relatives -- as in the case of the Yutenji Temple remains in January. Identifying the bones of Korean forced laborers exhumed in August 2006 from a field in Sarufutsu village, Hokkaido. Virtually all of these legal efforts have failed due to the claims waiver language in the Japan-South Korea treaty and time limits for filing claims. A decision by the Toyama District Court in September 2007 was typical. Judges dismissed the suit by elderly female plaintiffs, but agreed that as teenagers they had been threatened or deceived into going to Japan and then forced to work at a factory where they were confined without pay. Three companies -- New Nippon Steel, NKK, and Nachi-Fujikoshi -- have compensated a handful of Korean forced labor victims over the past decade in isolated cases through out-of-court settlements. Led by Mitsubishi, Japan's top wartime munitions manufacturer, Japanese industry has otherwise evaded all responsibility for the massive forced labor program. More than 600 elderly Koreans were moved -- at Japanese expense -- from Sakhalin to South Korea last October, in the latest phase of a program that has resettled 2,300 people since 1992. Japan denies official responsibility for encouraging or coercing as many as 150,000 Koreans to move to Sakhalin before 1945, but Tokyo has quietly spent millions of dollars building a special village for the repatriates in South Korea. Late last year a dozen Sakhalin Koreans, now living in Sakhalin, South Korea and Japan, filed a new lawsuit seeking the refund of money they deposited into postal savings and postal life insurance accounts when the island was part of the Japanese empire. Late 1970s photos of the former Akasaka coal mine in Fukuoka operated by Aso Mining, the family firm of previous Japanese Foreign Minister Aso Taro, and a Korean forced to work there during the war. Aso Mining used an estimated 12,000 Koreans, as well as 300 Allied prisoners of war, for forced labor. William Underwood, a faculty member at Kurume Institute of Technology and a Japan Focus coordinator, completed his doctorate at Kyushu University on forced labor in wartime Japan. He can be reached at kyushubill@yahoo.com. Reprinted with permission of the author.